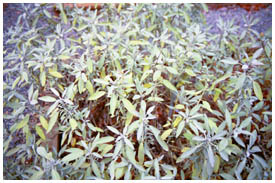 When compared with many other plants herbs require very little care. How often do you need to spray and / or trim the plants in your garden? Herbs, by comparison to most other plants, do well in poor soil, require little fertilizer and only modest watering. Provided they get enough sun and some water, they usually do well all on their own. This doesn’t mean that you can just throw some seeds down and walk away, you will still need to do some planning. For a start, as herbs thrive well in relatively poor conditions, it is easy for them to become overgrown. Lavender will spread, as will Mint, Yarrow can take over large areas. Even Chives can get bushy and packed. There fore you must start with adequate space in your garden or pot for the number of plants you have in mind, or reduce the number of plants if space is limited. Most varieties of herbs will get along fine with about a foot of space between major sections. For example, Chives look great and grow well in a bunch. However the roots still need a certain amount of nutrient and water. Other nearby plants will be competing for those. As many Herbs originate from the Mediterranean area they do well in rocky, relatively dry soil, remember that they evolved in conditions of good drainage. This means that they do need some water, they’re not cacti, the soil should be moist but not wet. So while soil preparation is minimal it is not non-existent, a mix of sandy loam and clay or a good compost will support a good range of Herbs, but it must be well drained. Taking Lavender and Sage as examples, they can survive in most areas with no manual watering, as the occasional rain shower is enough for them. While Mint will need a little more water, so depending on your location an automatic watering system may be a good idea. By taking the time at the preparation stage to minimize weeds you will save a lot of time and effort later. So using a landscape fabric around the pants will save problems with weeds later. You will not want to deal with weeds at a future point by digging as this can damage the roots of the Herb or by using chemical sprays on the weeds, as these can kill the Herbs as well, (most weeds and herbs are biologically similar). Also do you really want to be spraying chemicals that are designed to kill living organisms onto plants you plan to eat later. Herbs resist insects well, but you may want to help by being prepared to sacrifice some for the sake of preserving others. Dill will make for a good 'trap crop', this is one which attracts pests away from other plants such as tomatoes. If your goal is growing Dill, a small amount of insecticide will take care of the problem, but use the minimum possible. Plan when you want to plant by judging which herbs will do well by beginning at various times of year. Some can be sown anytime, others should be planted at intervals of four weeks, still others should begin as early as possible after the snows melt. By planning ahead and you'll find your herb garden is easy to care for and will thrive for many years with very little effort.